The Serendipity Trust Teacher Training Program provides hundreds of teachers with training and development through our Annual Teacher Training Programme. Our team of experienced & qualified trainers deliver workshops for Primary and Secondary English Teachers from rural and urban Sri Lankan schools, Preshool teachers from local Montessori schools and Student Teachers from Government Teacher Training Colleges throughout the region. 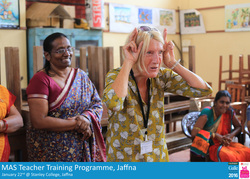 Serendipity Trust trainers also run weekly workshops at the request of the Unawatuna Teacher Training College. These sessions are presented to student teachers who are yet to begin or early in their careers as teachers in Sri Lankan government schools. Serendipity Trust trainers also run weekly workshops at the request of the PasdunrataTeacher Training College. These sessions are presented to student teachers who are yet to begin or early in their careers as teachers in Sri Lankan government schools. The training team has also delivered specialised training for pre-primary teachers from over 70 preschools. The 2018/2019 program commenced with workshops across Sri Lanka in the North Western, Western and Southern Provinces. Workshops have already been delivered in Puttalam, Vauniya and Maharagama. Workshops will be delivered in Udugama, Deniyaya, Hambantota, Walasmulla, Elpitiya, Hakmana (Mulatiyana), Akuressa and also Kilinochchi. Stay tuned for full updates from April 2019. During 2017 and 2018 workshops were delivered in the Galle, Tangalle, Udugama, Akuressa, Morawaka, Elpitiya and Walasmulla Education Zones. These schools were identified by the Southern Provincial Education Department as being in desperate need of training opportunities. 300 Pre- Service Teachers at Pasdunrata College of Education, Kalutara. This workshop introduces and practices numerous short activities, which can be taken directly into the classroom, across age ranges, to stimulate conversation, broaden vocabulary and build confidence through songs drama and stories. This workshop was designed specifically to encompass the new oral curriculum. It provided opportunities to discuss, activities to enjoy and songs appropriate to each of the following topics. Opportunity for experienced Training Consultants to offer informal support and training to staff members from the Southern Provincial Education Office and Zonal Education Offices. Huge thanks to the Department of Education (Southern Province), the respective Education Zonal Offices, our team of experienced and hardworking teacher trainers and of course the wonderful teachers for always participating with such energy and enthusiasm!